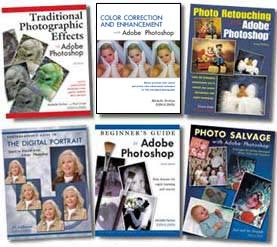 Photo Retouching with Adobe Photoshop: This unique manual teaches the specialized techniques for correcting photos using this technology. Readers will learn how to restore damaged photographs, correct for blemishes, change backgrounds, and add or subtract people from an image. Filled with practical examples, this book teaches everything from input via scanning or digital photography, to image manipulation, to final printed output. Toning Techniques for Photographic Prints For each type of toning, an overview tells you how the process affects your image. Then, step-by-step instructions are provided for each phase of the toning. From the classic look of sepia, to rich archival toners, to toners in all the colors of the rainbow, this book is the tool you need to use toners with confidence-and achieve dazzling effects! 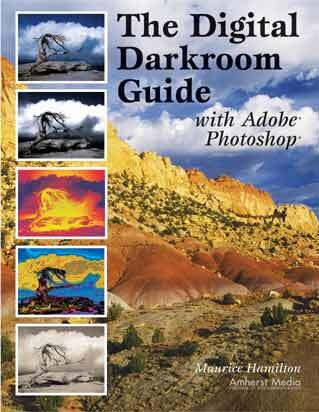 The Digital Darkroom Guide with Adobe Photoshop With the myriad special effect made possible with Adobe Photoshop, you can easily lose sight of the bigger picture-the quality of your image. Author Maurice Hamilton provides a step-by-step, measured, and well thought out method for fine-tuning images, allowing you to bring out, rather than mask, the true spirit of each image to produce fine art. You'll learn to create traditional darkroom techniques digitally, so that you can adjust brightness, contrast, and color balance of your images to ensure that the full potential of each is achieved. Into Your Digital Darkroom Step By Step Coax the very best qualities out of every digital and film image with the techniques in this book. With these simple instructions, you'll quickly learn to produce effective image enhancements without wading through complex techniques for wild special effects and design tasks never intended for use by photographers. Written by a photographer, for photographers, this book teaches all of the indispensable techniques you'll need to refine and output top-notch photographers time and again. Perfect for practitioners of every genre of photography and of any experience level, this guide begins with a look at how to select the necessary hardware and software. You'll also investigate the qualities of a digital image, including resolution, file size, file formats. Next, you'll use downloadable images to gain hands-on experience in color correction, montage creation, retouching, tinting images, and repairing damaged images. From start to finish, this book offers the tools you'll need to polish each imge for the best possible results.